After Christmas our bubble will burst, I have to return to work and will no longer spend every day with Baby (don’t tell her). So I want to make these last few months count, as we will never get this time back again. 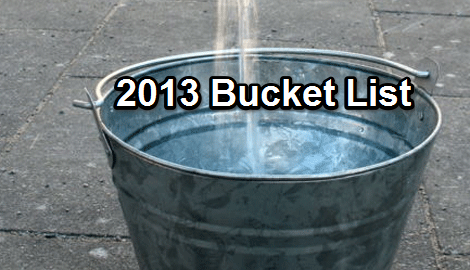 So I decided to create a Bucket List for 2013, containing all the things I want to do or achieve before 2013 waves farewell. 3. Make Baby a dress (O.K so I might have come over all Kirstie Allsop, but really would like to try). Not a dress, but I have made her two skirts. 5. Find a pony for Baby to sit on O.k so it was a donkey and not a pony, but it will do! 9. Decide on Baby’s first Christmas and 1st Birthday presents. I really want these to be long lasting presents that she can cherish for years. First Christmas presents bought. She has a wooden swing as her main present. 10. Enter a baking competition – I did it and was joint 3rd! 11. Continue to document as much of Baby’s development through pictures, so she knows how much she was loved everyday.